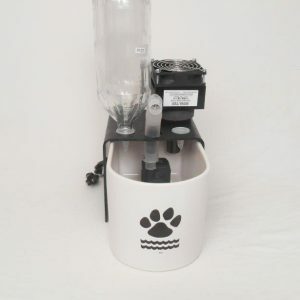 View cart “High Capacity Basic Cat and Dog Water Fountain” has been added to your cart. 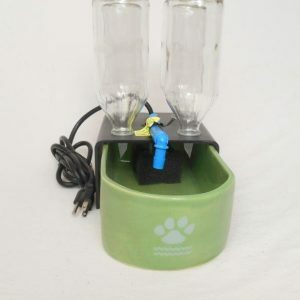 The Perfect Pet Fountain is the state-of-the-art in science-based technologies for the therapy and prevention of feline kidney disease based on the empirical evidence that cats prefer cool water which can triple their water consumption. Nutritional experts state that cool water is more easily absorbed which aids the kidney to remove metabolic toxins that can harm the entire urinary system. Feline kidney disease is the most common condition and often becomes the most emotionally and economically costly disease encountered by cat owners. The Perfect Fountain includes an electronic Ice Probe Chiller which automatically maintains the water temperature at 15° F. below ambient (room) temperature. 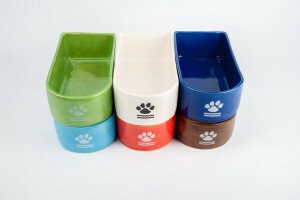 In all other respects, the Perfect Pet Fountain is identical to the Basic Pet Fountain. 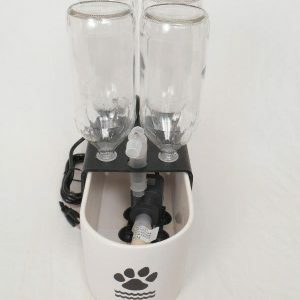 The Perfect Pet Fountain is the state-of-the-art in science-based technologies for the therapy and prevention of feline kidney disease based on the empirical evidence that cats prefer cool water which can triple their water consumption. Nutritional experts state that cool water is more easily absorbed which aids the kidney to remove metabolic toxins that can harm the entire urinary system. Feline kidney disease is the most common condition and often becomes the most emotionally and economically costly disease encountered by cat owners. 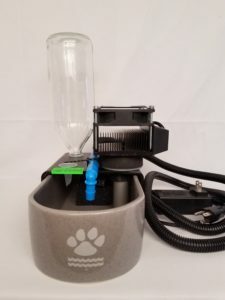 The Perfect Pet Fountain includes an electronic Ice Probe Chiller which automatically maintains the water temperature at 15° F. below ambient (room) temperature. In all other respects, the Perfect Pet Fountain is identical to the Basic Pet Fountain. • Thermoelectric Ice Probe™ Chiller uses the Peltier principle to transfer cold through a solid aluminum probe to the water in the basin resulting in water temperature that is about 15°F. below ambient (room) temperature. (See this link to understand how it works: http://www.novatecproducts.com/iceprobe.htm) The IceProbe® is powered by a separate 12 volt D.C. power supply and draws less than 50 watts. • Adjustable, long lasting, and quiet professional grade submersible fountain pump with 6-foot long grounded (3-prong) electrical cord provides safe use of electricity to prevent accidental electrocution. 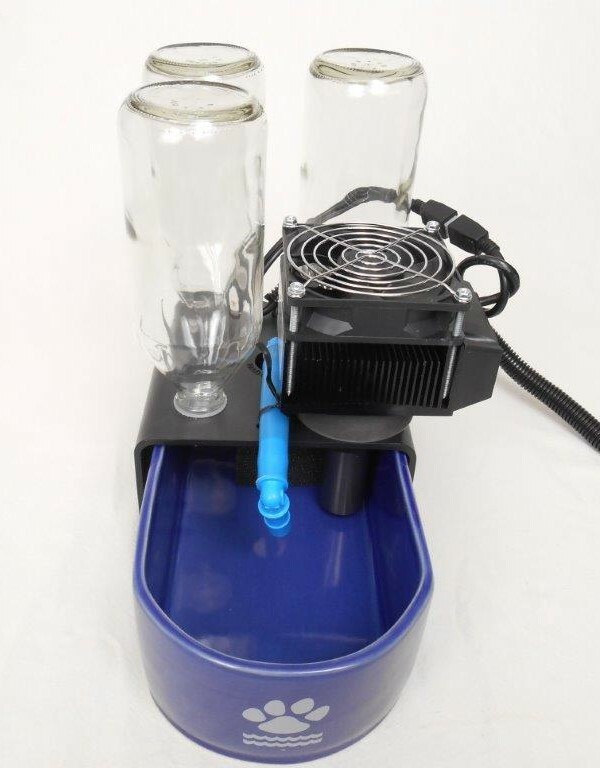 • In-Line Charcoal Filter made from sterile pharmaceutical-grade blue tubing with NSF Water-Safe Charcoal (granular activated charcoal) inside the blue tube (held in place with two small foam plugs) to trap impurities as water is forced through the tube. The blue antimicrobial protected tubing is extruded with an inner liner that releases silver ions to protect against colonization by pathogenic bacteria. Silver ions also inhibit the growth of biofilm forming molds, fungi, and algae. No toxic plasticizers, DEHP or phthalates are used as additives in the manufacture of the tubing and fittings. In addition, the tubing and fittings are free from PVC, Bisphenol-A and animal derivative components. The tubing and fittings meets European REACH and RoHS requirements and will not emit toxic chemicals if incinerated. Elbow fittings provide easy connection to the pump on one end and easy 360-degree flow adjustment on the other end to customize the water flow and water noise level to your cat’s preference from a bubbling fountain (pointed straight up or sideways) to no splash at all (pointed straight down). 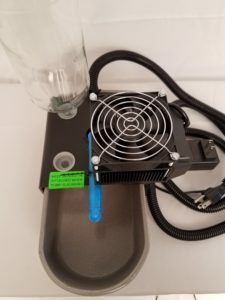 Rechargeable charcoal option results in the lowest cost available for any charcoal filter on the market. 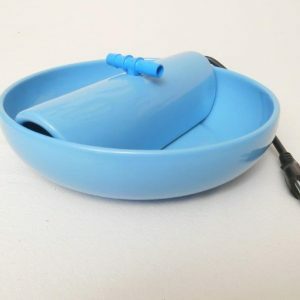 • Square foam pre-filter with round hole in middle designed to fit snugly around the Perfect Pet Fountain pump to prevent pet hair and debris, including saliva, from being sucked into the pump, increasing time between pump cleanings and improving pump longevity. • Medical-grade black ABS plastic bridge with 3 plastic Cap/Spout Combinations to hold glass refill bottles. Ice Probe Chiller is attached at 4th hole position. Bridge with attached chiller, pump and filter component system easily lifts off Ceramic Basin for easy cleaning and water replacement. • Chiller warranty – please see our policies.